« ANOTHER NOVEMBER SPECIAL OFFER: Buy or upgrade MacVector and receive Assembler for free…..
For quickly finding a single primer in a sequence the Find dialog is the first point of call. This allows you to find any sequence, whether it binds to the complementary strand, it is reversed or both. It also allows you to state which end of the sequence to start from and in which direction to scan the sequence (not necessarily obvious!). The Find dialog (see below) is a little daunting to look at first (in fact due to recent user feedback we will hiding most of the functionality in the next release). However, it is very powerful and in most cases you do not need to change anything as the default settings will work for the majority of cases. 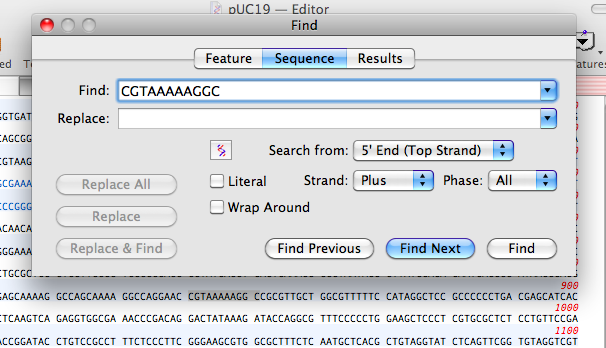 (ii) Enter your primer sequence in the FIND box and click FIND. Limitations: You can only find a single primer. Only perfect matches are allowed. No primer statistics. (ii) Import your primer sequences. – If you suspect your primers may not be a perfect match then reduce SCORE THRESHOLD until your primer aligns. The resulting alignment will show your primers aligned against the template. You can switch to the Map view to show a graphical overview of all your primers and where they are located on the sequence. 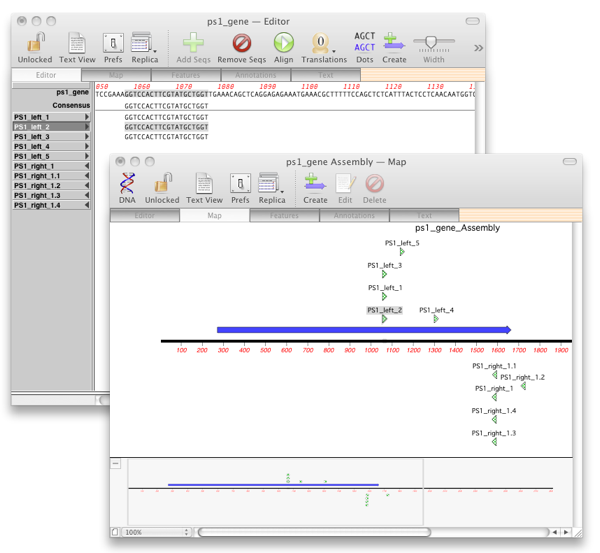 You can use the Editor view for a sequence level representation of the primer aligned against the template. Limitations: Your primer sequences need to be in a file already. No primer statistics. Analyze Primer->Test PCR Primer Pair.. 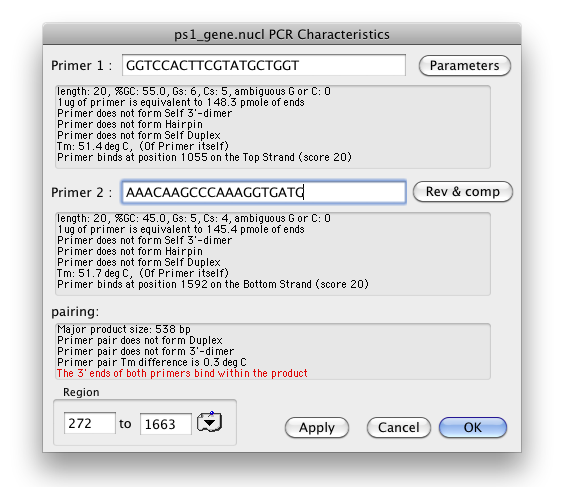 This function is fairly easy to use and gives a large amount of detail about your primers. For example secondary structure, what size the product will be and even the most ideal Tm for your PCR run. (ii) Copy and paste your two sequences in the two boxes. Note you will need to have pasted them into an external application. (iii) Click APPLY and see your primers detailed statistics. (iv) Click OK to see the full statistics on the primers and product. When to use: When you need detailed output about a pair of primers and their product. Including recommended Tm for the annealing stage of the PCR. Limitations: You can only analyze a pair of primers. Subsequence searching allows you to find any significant region with a consensus sequence, in your sequence. This function allows you to keep a library of sequence patterns of either nucleic acid or proteins. You can use subsequences with complex patterns for the search as this function uses a powerful nomenclature (similar to Prosite’s) for creating patterns. 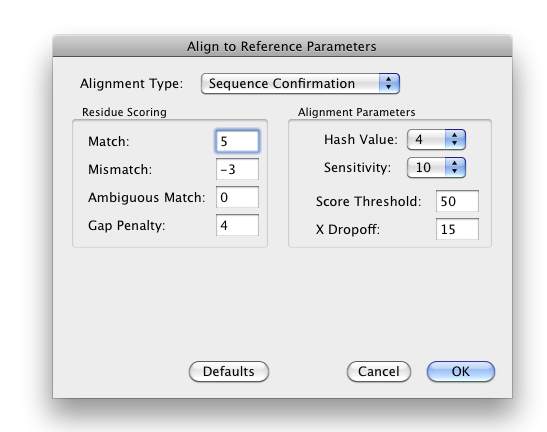 Furthermore each pattern can have up to three distinct segments, separated by variable inter-segment regions, and you can control the overall similarity required for a match as well as defining residues which must be 100% conserved. A common usage of this function is storing a library of primers. You can easily create such a library by creating a CSV file of your primers. Then you can use the Primer Convertor tool to convert this CSV file into a subsequence file. Primer Convertor is supplied with MacVector, however, you can download an updated version of this utility from here. (ii) Select ANALYZE.. > SUBSEQUENCE. (iii) Choose your subsequence file and click OK. Limitations: You need to prepare a subsequence file containing all your primers. Currently Design Primers (Primer3) is not very flexible when it comes to testing primers as opposed to designing them. There are no preset defaults for testing primers. However, it is a powerful tool and will uniquely allow you to design a new primer to match an existing primer. To use this tool you need to change the default settings which are meant to design a pair of primers to amplify the selected sequence. (iii) Select REGION TO SCAN from the design method drop-down list. (iv) Change area to scan to be the full length of your sequence. (v) Ensure that the REGION TO SCAN values entirely encompasses the area that contains the expected product (easiest way is to select the entire sequence). (vi) Ensure that the PRODUCT SIZE limits are above and below the expected product size (TIP: make them generously above and below). (i) Select the feature that you want to amplify. (ii) Select ANALYZE > PRIMERS > DESIGN PRIMERS (PRIMER3). (iii) Change the drop down menus of each primer field to USE THIS PRIMER and paste in your primers. (iii) If you want to design a primer to match an existing primer change the drop down menu of your existing primer field to USE THIS PRIMER and paste in your primer. Leave the other drop down menu to FIND PRIMER. (iv) If you know your primers are either 200bp upstream or downstream from the 5’/3′ end of your feature then keep AMPLIFY FEATURE otherwise select FLANKING REGIONS from the design method drop-down list and enter a large value for each region. The above steps are more complex than they should be. However, most settings are preserved between runs, and the next time you run it the settings will already be correct. Limitations: You can only analyze a pair of primers. Some of the output is limited for example you will not find the recommended Tm. This entry was posted in Techniques, Tips, Tutorials and tagged pcr. Bookmark the permalink. Both comments and trackbacks are currently closed.